I hate washing my hair. Sure, it feels good, but I hate it. The main reason is that it adds at least 30 minutes to my morning. I know-I love my regime-but I still like to be in and out as fast as possible. Plus, my hair is much easier to style when it’s dirty. And according to my hair gurus it’s better for your hair. So I usually wash my hair twice a week. Gross? Not when you have dry shampoo! I love dry shampoo for many reasons. It eliminates the greasies, it gives my hair oodles of body, it smells yummy and it SAVES ME TIME!! But alas, not all dry shampoos are created equal. I have tried A LOT of brands (I’m a huge product junkie). Many left a white residue, which is okay on blonde hair, but not great on dark. I do really like Ojon’s Full Detox Rub Out Dry Cleansing Spray. It smells good and doesn’t leave a white film. But at $24 a bottle, I needed to find an alternative (remember-no job). Then Suave revamped it’s Professional line and added a dry shampoo to the mix. And yay!! It’s awesome!! It has an amazing lemon scent, leaves no white film, and best of all-it’s $2.99. That’s right-under $3!! Dare I say it’s even better than the “designer” brand? Yes, it absolutely is. I am a true convert to the Suave brand in general. They have, in my opinion, really done a great job with the Professional line and most items are under $5. If you want to give dry shampoo a go, but have dark hair, give the Bumble and Bumble line a try. Their dry rubs come in different shades. The only down side is the color can come off on your hands and it is more expensive at $39. But it is a good alternative. Both Ojon and Bumble and Bumble can be found at Sephora. Suave Professionals can be found at many drugstores, including Target, Walgreens, and CVS. 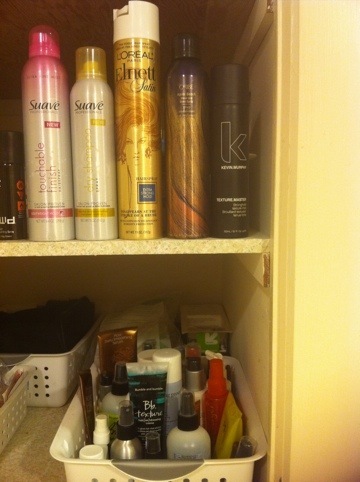 A peak at my hair cupboard-product junkie! I really like Oscar blande (sp?) dry shampoo- white powered yes:( but they have a spray too. A tad more than suave at $11. 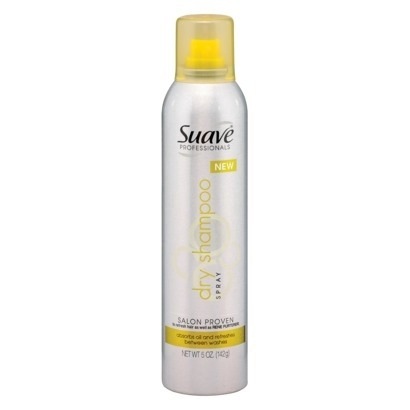 I have also used many different shampoos – not dry – and Suave shampoo is great. It’s often on sale for $.89 a bottle. Can’t wait to try it! I hate shampooing too!!!! I fell in love with Naturia, but have been looking for a cheaper alternative. After all, I use dry shampoo more often than regualr shampoo. Not only does it cut time out of my routine, but it is so great for camping and long road trips. My man uses it too! It rocks for camping trips! I tried both the Suave and the Ojon, I have to say I really like the Suave best, although I really appreciate how much more milage they both give me. They both have clean, fresh scents, too. Thanks so much for the tip~ I never knew!! !